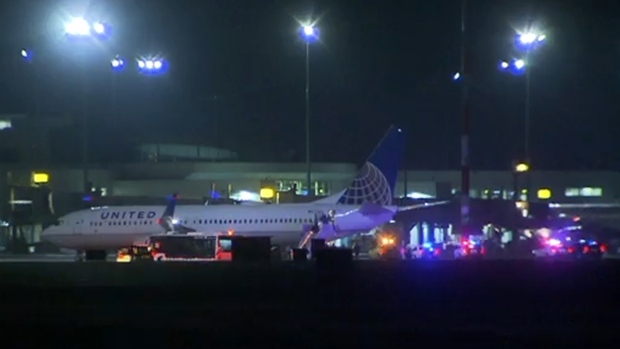 A United Airlines flight on its way to Denver, Colo. was diverted to Vancouver International Airport this morning over a security concern, airport officials have confirmed. United Airlines Flight 1104 departed from Anchorage, Alaska shortly before midnight and landed at the airport at 4:16 a.m. local time. An airport spokesperson confirmed to CTVNews.ca that the aircraft remains at Vancouver International Airport and the passengers have been moved into the terminal for processing. Meanwhile, Richmond RCMP said one suspect is in custody, and airport operations have not been affected. We have a suspect in custody. @YVRairport operations unaffected at this time. More information when available. A passenger on flight 1104 said a man who "seemed anxious" and who was repeatedly getting up from his seat appeared to be the reason the plane was diverted. "There was a passenger who was clearly disturbed in some way," Chris Steiner told CTV News Channel on Saturday, while waiting inside Vancouver airport. "For what reason that is, I don't know, but he was making threatening statements in the back and they eventually had to divert the flight." Steiner said the plane was flying over eastern British Columbia when it suddenly turned mid-flight. "It was really bizarre," he said. "(The crew) didn't say anything and then all of a sudden we were landing. "I think a lot of the passengers thought we were in Denver," he said. He said passengers were questioned by authorities and had their baggage sniffed by a police dog after leaving the plane. Steiner said a new flight from Vancouver to Denver is scheduled to leave at 2 p.m. local time.